That's not an exaggeration. There was a point this morning when a nervous breakdown seemed very possible. I won't go into the details, but let it suffice for you to know that the day started with 4 whining children, one of whom is prone to unprovoked biting and another of whom is capable of turning nearly every object in sight into a deadly weapon. Thankfully, everyone survived long enough for me to think of a way to keep the unruly crew entertained while still spending time outside soaking in one of the most beautiful brisk fall days. This is what we came up with: treasure hunt leaf necklaces. Each sweet whiny child got a bag, and was sent off to collect leaves from around the yard. After they all had a good stash of 10 or so leaves, I used a hole-puncher to make a hole in each leaf, then gave them each a piece of string to thread the leaves on as beads. The necklaces turned out beautifully and--most importantly--kept everyone happy, including me. Fighting ceased for a full 45 minutes. (Almost) no whining was heard, and the first necklace didn't break until just before nap time. I'm on a bedroom kick this week. Actually, I've been on a bedroom kick since we moved in. However, it's heightened this week with our decision to switch bedroom locations after trying fruitlessly for the past 3 months to keep little people and their plethora of toys out of our little room and in the adjoining playroom where they are most welcome to build forts and play "pirates" and "Olympics" and "Fighting Irish football" anytime they want. While our decision to move upstairs will deprive our kids of the pirate ship/trampoline/football field that moonlights as their parents' bed, they'll be gaining a craft room and library lounge--doubling their play space. I think it's a pretty fair compromise. So that brings me to my point, bedrooms. Ours needs to be calm. The new space is even smaller than our current room, so I've decided to try to keep it as simple and balanced as possible in hopes that even when strewn with clothes and--let's be honest--baby toys, it will still retain some semblance of peace and sophistication. 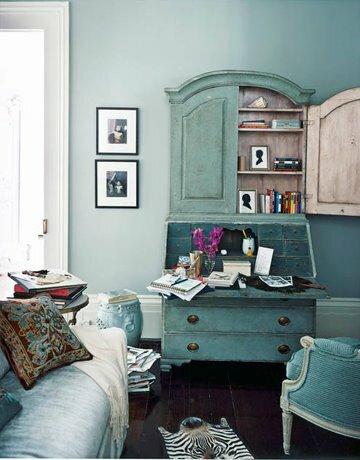 Here are a few more balanced beauties from Beautiful Homes and Garden's Real Life Bedrooms: Enjoy! 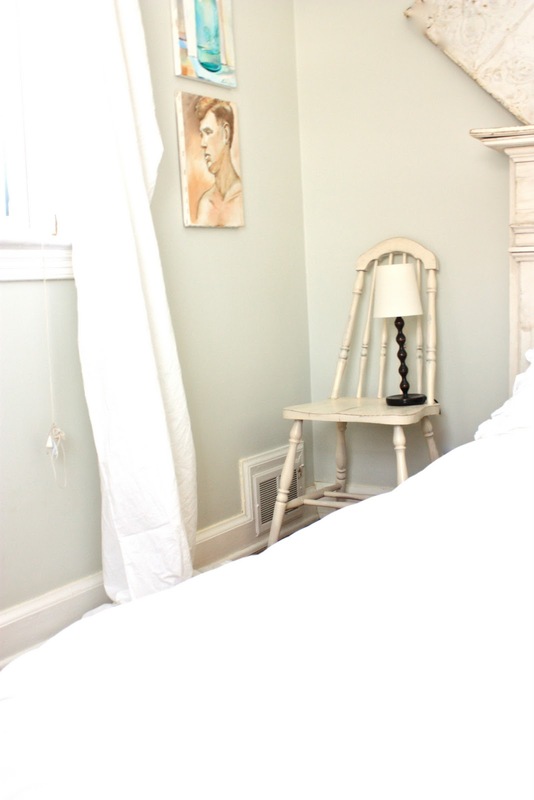 You can see a few more in this post which includes a picture of what our bedroom looked like before we got our neutral loving hands on it. 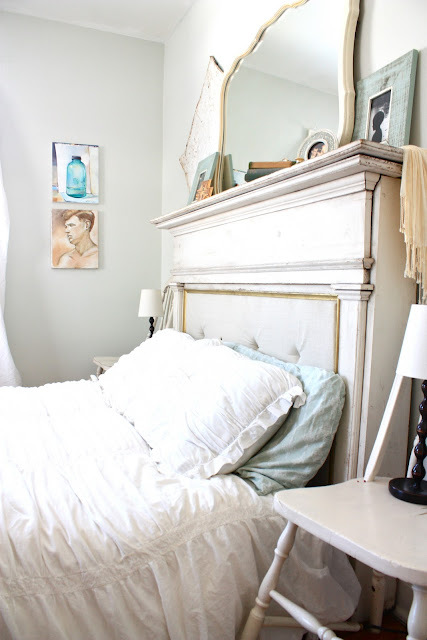 I made the headboard out of an old mantel, and you can see my list of instructions on Apartment Therapy. so needles to say, I was thrilled to discover the oar which, as it turns out, also hails from the North East. It is so worn and weathered. I'm in love. 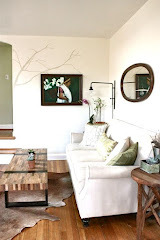 Before finding it, I already picked out the perfect place for it--hanging on the white-washed exposed brick wall leading from the playroom to the kitchen, but now I'm not sure because it honestly looks fabulous everywhere. Who would have thought there could be so much potential for a 70 year old Nantucket oar? There is a sad part to this story though. 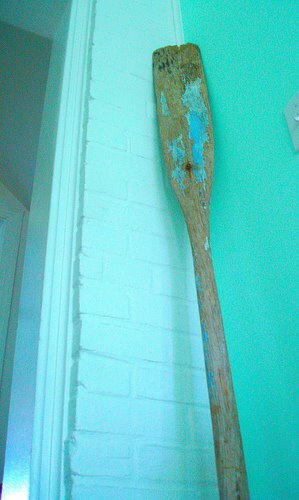 When I went to pay for the oar, I chatted on and on to the the cashier about how the lady who owned the store, Maria, had sold me our beloved headboard and about how much I enjoyed her quirkiness and good life advice. Then I asked where she was that day, and the poor cashier looked a little confused and told me that she had passed away a number of weeks ago. I'm not used to bursting out in tears in public, but I did that day. I had only met her that one time, but I bawled as if she had been an old friend. The lady at the register turned out to be her daughter. We had a nice talk, she gave me a hug, and she assured me her mother was in a better place. I know it is true, but still, death is always so striking. I don't think there is a perfect way to prepare for it, even for an aquaintance's death. The happy part is that I have some lovely things by which to remember what seemed like a remarkable person. Also, now when I look at the oar, I try to be grateful for the happy friendships I've made, even if we meet just one lovely time. as we move into bedroom design mode in our home, I've spent some time searching through a variety of fun, appealing styles. These are a few of my more eclectic favorites, ordered from gypsy wagon (which always reminds me of my younger sister, Mo) to neutral serene. featured in Domino. 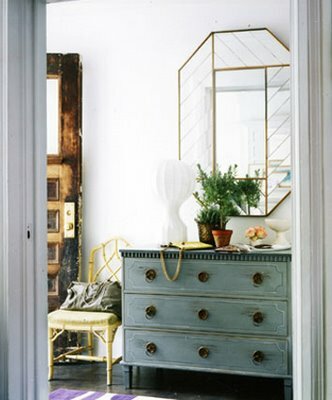 While the palette is fairly limited, the layering and mix of patinas and finishes make it feel alive and sophisticated. There's an appealing casual variety of shapes and textures and the contrasts that provide a lot to look at without feeling the least bit overwhelmed. I always think that one of the most exciting parts of home design is seeing how modern and traditional elements blend within a single space to form a distinct look. Achieving that lovely ordered variety can be difficult. 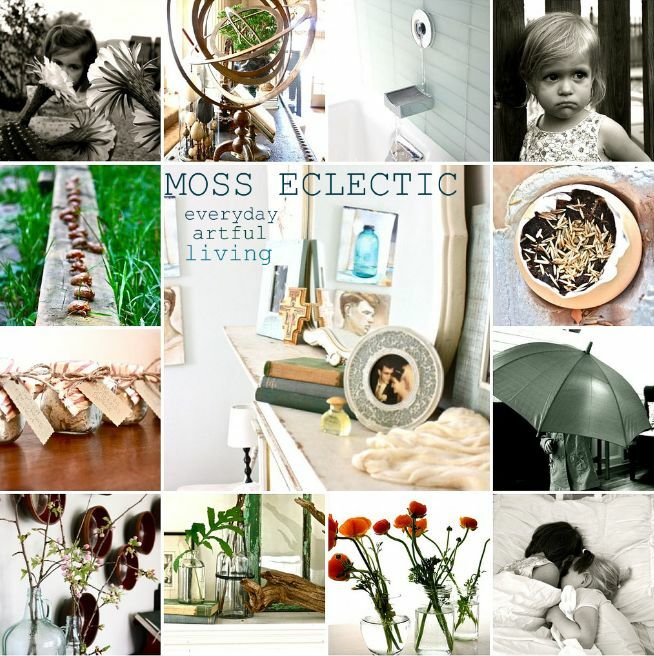 It seems like most eclectic mixes end up appearing too cluttered and chaotic. 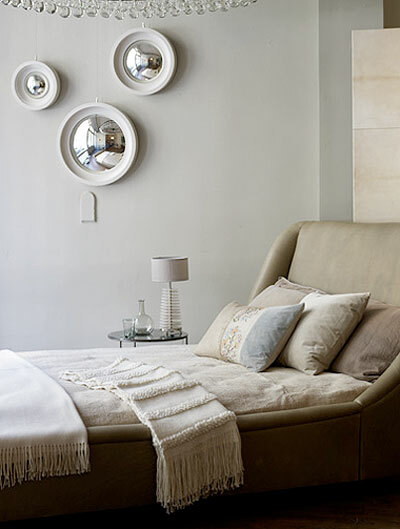 While none of these particular bedrooms call out to me to be imitated in my own home, I think each does a fine job of balancing a lively variety of furnishings. 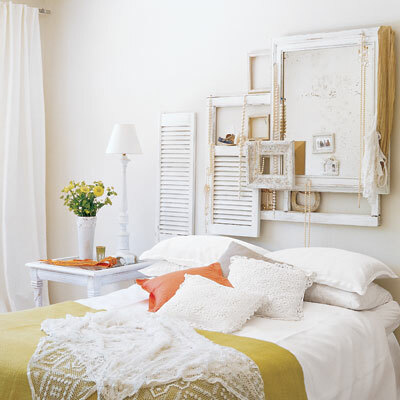 I hope we can incorporate that blissful balance into our own room this weekend! Last week was a little busy as we settled into the new routine of preschool, babysit-swapping, and work, in addition to preparing for our trip to the ND-Michigan game (go Irish!). On one especially exhausting evening as I stumbled through our toy-strewn kitchen trailed by a whiny toddler to suggest going out for dinner to my husband, I was struck by a lovely idea. 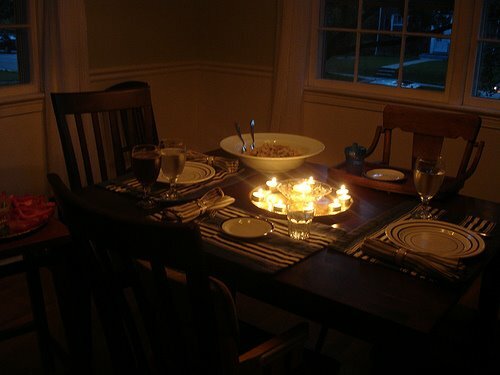 Easy seafood pasta and candles. 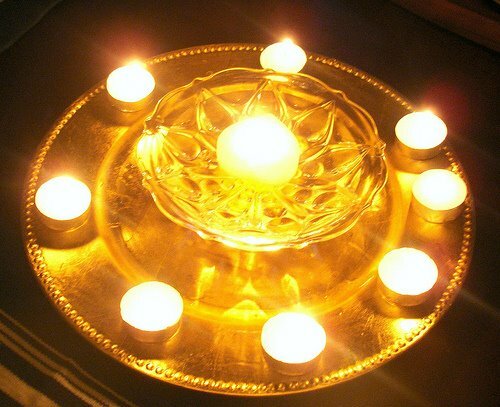 I didn't bother straightening the house, I just lit tealights and dimmed the lights. Magic! Candles bring instant serenity, but with the happy chaos of dining with young children we had gotten out of the habit of using them. I don't know why. Our girls were mesmerized, my husband was impressed with a relatively simple meal, and I felt calm even after a tiring day. embrace it. It's the best thing to come out of a can to date. In my youth, I thought it was only used by delinquents looking to deface public property. In recent years though, my lack of patience and our grad school budget have lead me to it many a time, and we have yet to be disappointed--especially with the dawn of spray paint primer. Instant gratification at it's best! My dear college companion, Molly, turned me onto it when we decided to give new life to this Salvation Army purchase. Little to no sanding, a coat of primer from a can, and this fabulous green. 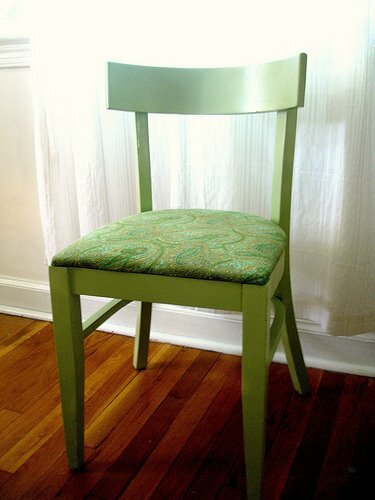 I also recovered the seat with left over upholstery fabric-- a nice change from purple pleather. Now it's my desk chair. 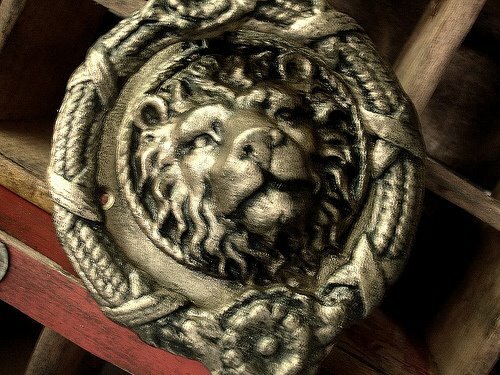 We are planning on painting our front door black and have been searching for the perfect door knocker. My sister and brother-in-law found this for us. It was originally a very cool cast iron, but it wouldn't really have stood out against the black door, so I gave it a coat of metallic brass spray paint, then sanded some of it off so some iron showed through. Then I sprayed it with matte black spray paint and immediately wiped off most of the black so that it only remained in the crevices, giving it a kind of aged-bronze look. I'm really happy with how it turned out. Can't wait to have a finished front door to hang it on. I also updated a cast off chandelier from my in-laws by spray painting it matte black and putting on mini silk shades. It was brass but didn't fit our decor, however now that it's a clean, simple black we love it for our dining room. 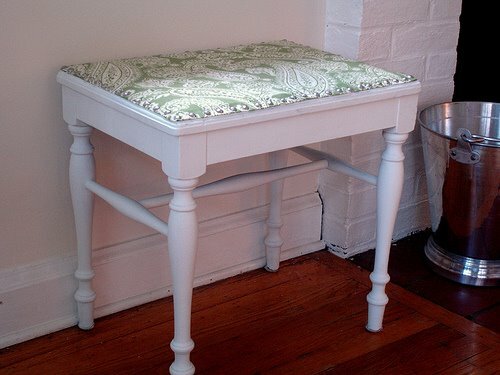 The lady who sold me our mantel surround headboard also gave me this pretty little bench. 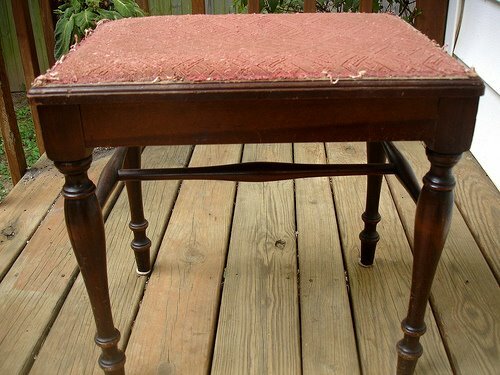 It's suprisingly sturdy and comfortable, but the upholstered seat and mahogany finish had seen better days. so with a coat of spray primer, another coat of brushed on "Tidewater" paint, and a newly upholstered seat withg silver nailhead trim, it fits perfectly in our living room. One of the best things about spray paint is it's durability. Most types are suited to adhere to metal and plastic, which aren't usually up for hosting regular wall paint long term. That being said, I've found that all spray paints aren't created equal. RustOleum definitely makes the best paint, and I've had the best luck with their Universal Spray Paint, which sprays evenly at any angle. You can buy at it at any hardware store. 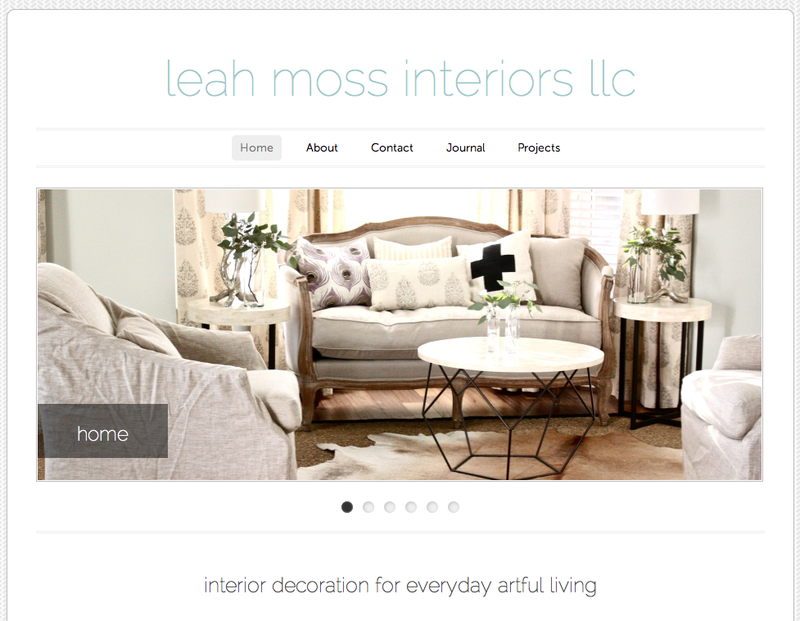 *special thanks to Kathleen for inspiring this post. Good luck with your projects! My lack of recent posts is due to the updated 'do. Nearly all computer time has been devoted to it--which tells you just how computer savy I am :) I was really inspired by the fall colors in the last round of blog pictures from our anthropologie outing and that, coupled with the anticipation of autumn, brought about a total mosseclectic facelift. I can't believe it's already that time of year, wow. We started preschool last week too, double wow! New seasons in all senses.